It’s a good thing I love hills! 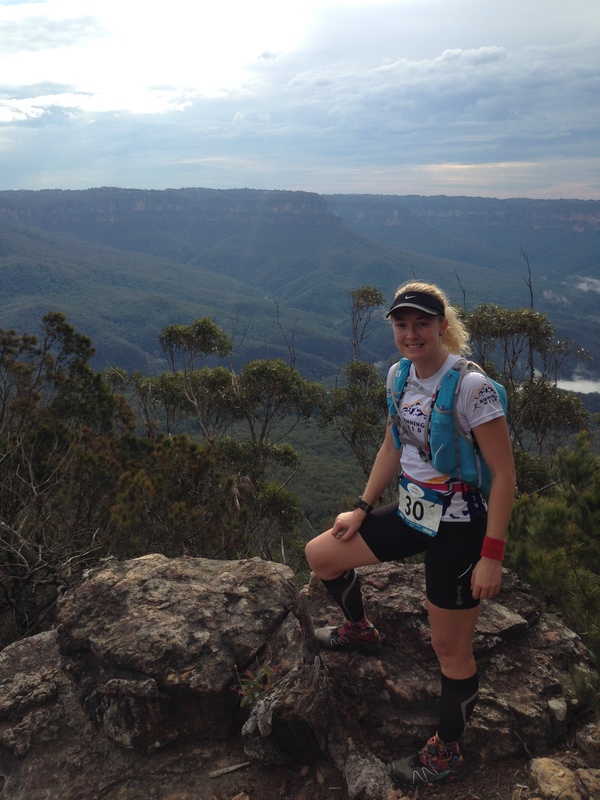 I feel like I say this every week, but I can honestly say that last Saturday’s Mt Solitary 45km Ultra Marathon was the toughest course I have ever attempted. But it was also the most fun!! 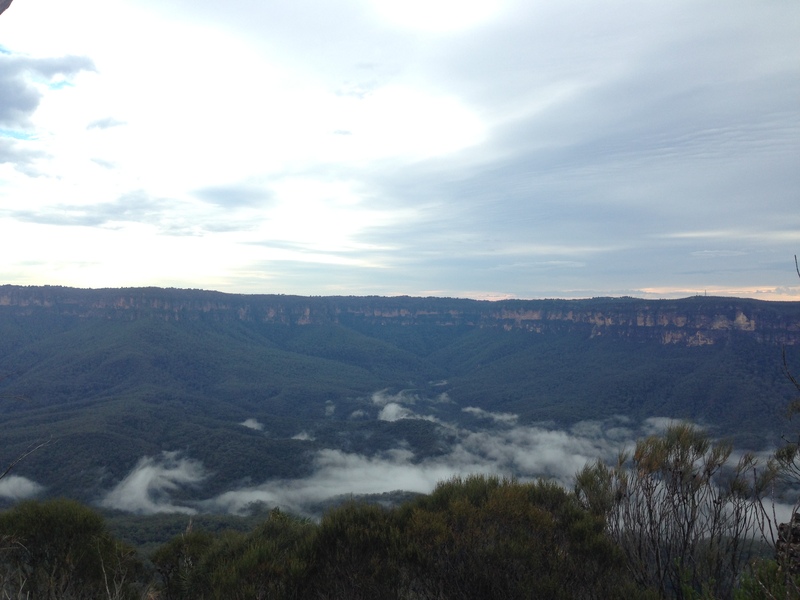 I got up at 3.30am on Saturday morning to have some breakfast (toast, banana & peppermint tea) before jumping in the car and driving to the Blue Mountains. It’s about a 2 hour drive from my place which includes a toilet stop at the servo near the end of the journey to avoid the queues at the start line. When I arrived it was still dark but thankfully not as cold as I had been expecting. There were a few other runners who were earlier than me and we got our mandatory gear ready for checking by the organisers. We were required to carry a course map, waterproof jacket, food for 3-5hrs, compression bandage, mobile phone, whistle, compass, space blanket and 2L of fluid. Plus they had added thermal gloves and a beanie/buff. I chatted with Craig from the Striders at the start line and ran into lots of running friends as we prepared for the race. I even ran into Simon & Mike from my run club in the city, I had no idea they were doing this race but it was awesome to see them out there! Sam from PwC was also there getting another long run in before TNF100 and feeling much better than when I last saw him at Six Foot Track. And the lovely Sherin who was having difficulty with her hydration pack which was leaking and I worried that she would not have enough water, but tried to stay positive and reassure her that it would be fine. We positioned ourselves at the start, a field of 168 runners with only 28 females. I know this means that I am guaranteed a Top 30 finish, but it would be great to see many more women out there competing. 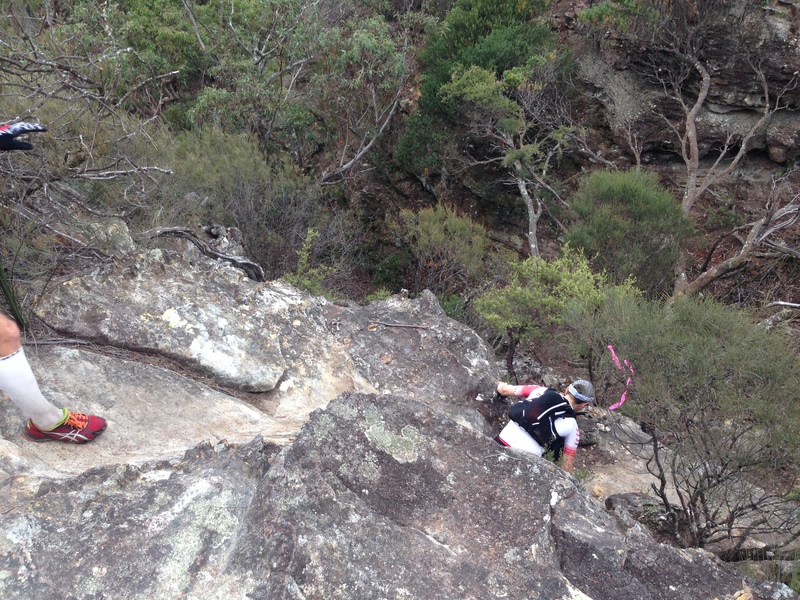 The gun went off and we all made our way up the first section towards the top of Kedumba walls for the first descent. My goal for the day was to make it to the Checkpoint at 25km before the cut-off time which was 5hrs 15mins, which meant doing roughly 5km per hour (or faster). There were some really funny guys running just ahead of me and we all laughed at their jokes and it put me in a really good mood from the start. They were hilarious! We ran down Kedumba and I love the downhill sections so I used it to get past a couple of people, knowing full well that they would catch me on the next flat or uphill, but you have to work your strengths. I used the downhill technique that Hanny and Graham had taught us at the training camp, and I was warming up and feeling good. 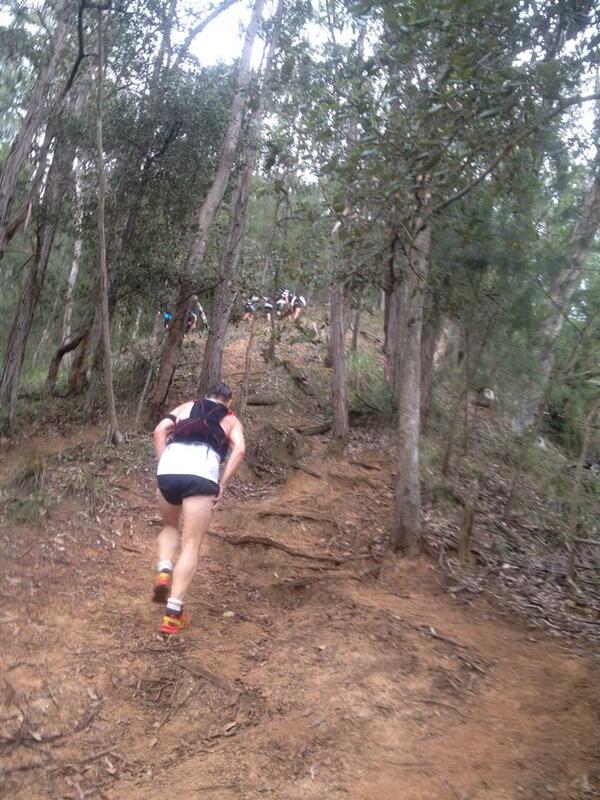 The first big hill we had to climb on this course was Mount Solitary and you knew it when you hit it. 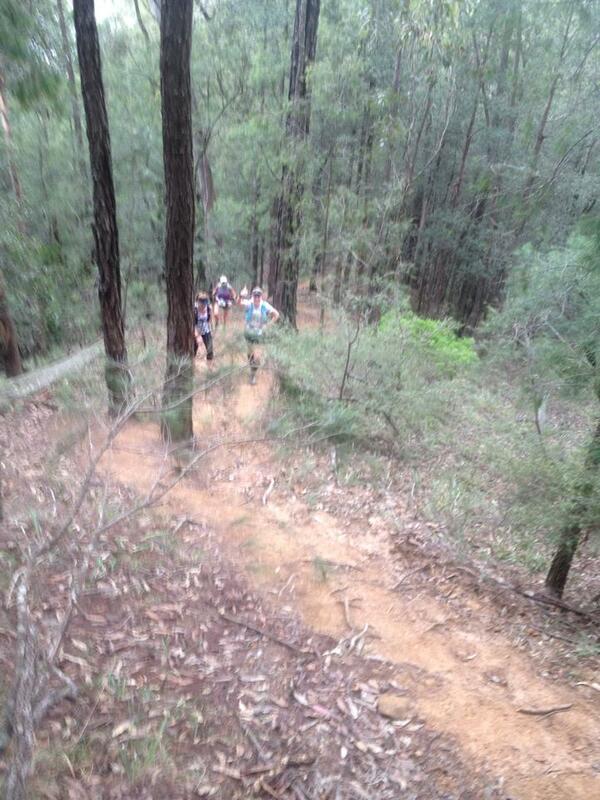 This was the slowest section of the course but it was also lots of fun. I had been chatting with a few of the runners around me and a Strider friend got some great shots of us making the climb so the next 4 photos are courtesy of Craig Thom. The first shot below is probably the least steep section, it only got rockier and steeper after this point and you had to get your hands dirty too. Here’s me holding up the speedsters (below). I let a few go past me on several sections as I need to make sure i left some fuel in the tank for the rest of the course. And that’s me having a drink break (below). 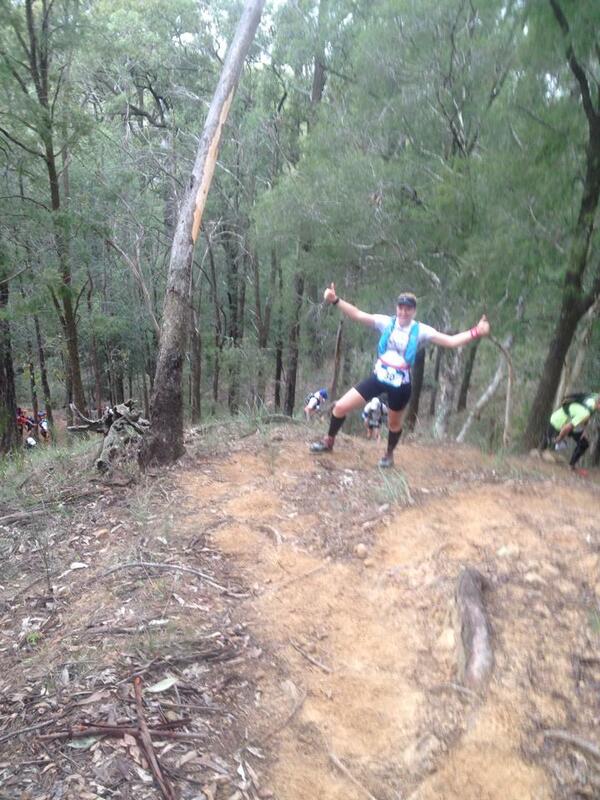 And another break (below) for some air I think, but still smiling and thumbs up! Once we got to the top it was rolling ups and downs and the views were magnificent. It was quite jaw dropping to think that we had started in the valley below and climbed our way to the top of the mountain….. the fog was so low beneath us too and i felt like I was up in the heavens. And then even more fun began! You would be running a long and all of a sudden there would be a cliff in front of you and the only way to go was down the rocks on the cliff edge. 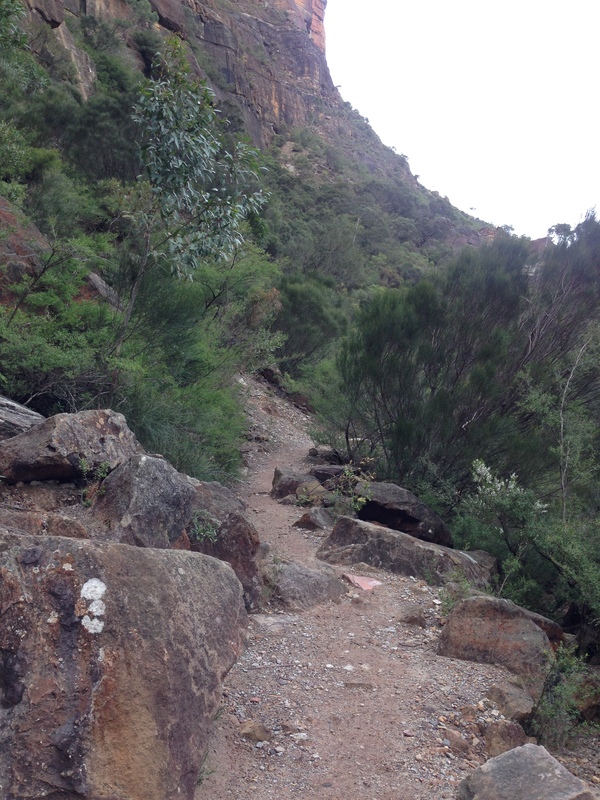 Here’s one of the first climb down sections that was a good taster for what was still to come. 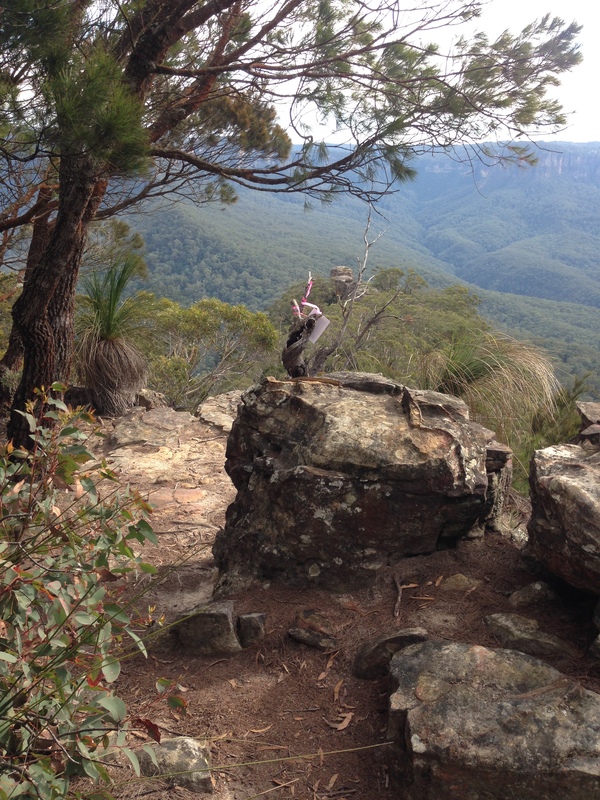 A new running friend (who I would later find out is called Blake) stopped to take in a shot of the view, and me being the tourist trail runner did exactly the same thing. So we decided to swap cameras and get a shot for each other. 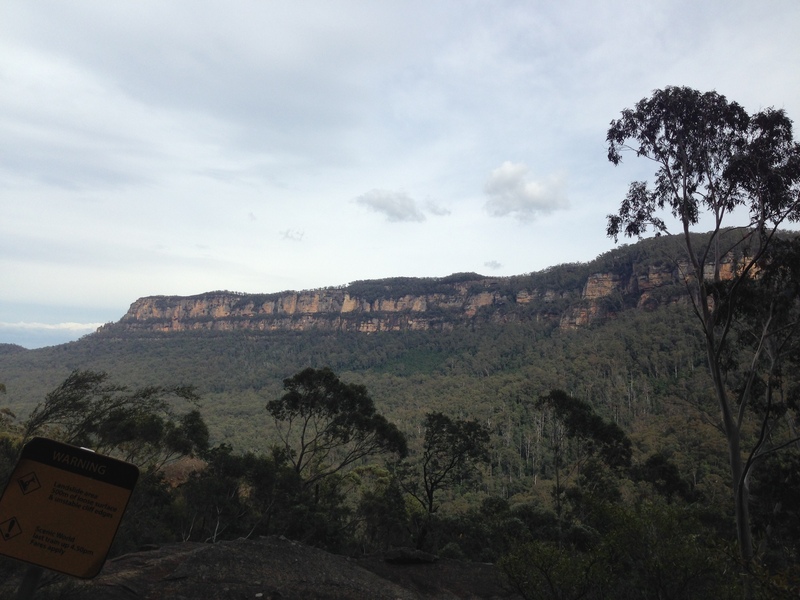 The view from Mt Solitary was amazing to say the least!! The steepest section of rock climbing took me a little by surprise. I had been running through some thicker bush for a while and then all of a sudden there was an edge with some pink tape. For the non-trail runners out there we always follows the tape along a course (today’s was pink) and it helps you to stay on track and not get lost. They are usually place every couple of kilometers and are most useful. So I could see this pink tape flapping in the breeze ahead of me and I approached it slowly and with caution…. 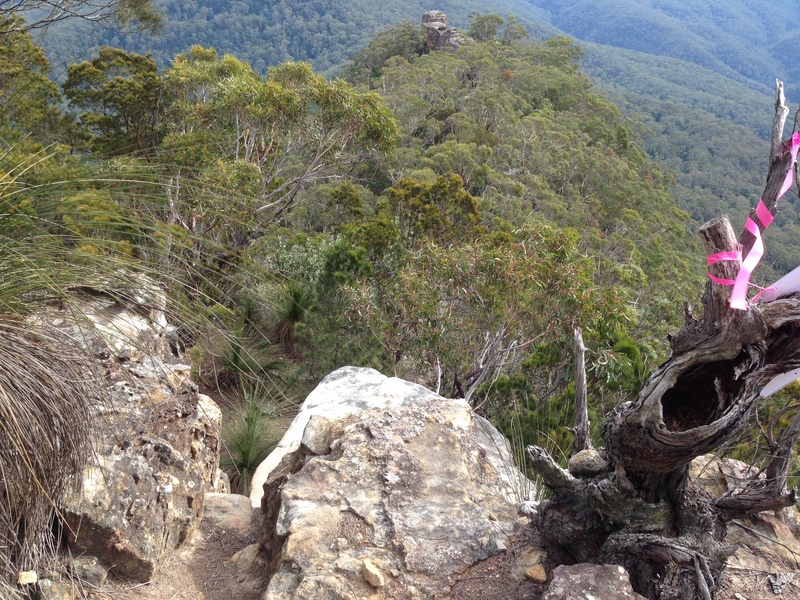 To say I have a slight fear of heights would be an understatement, so I crept closer and closer to the edge…. and realised this was going to be a very tough section for me. Look at that drop! I had to get photos because something a pictures tells a thousand words. And this one below should tell you that I was packing it!! But slowly I made it down the rocky section and back onto some much loved dirt. It was a most beautiful course, rolling hills everywhere you looked. 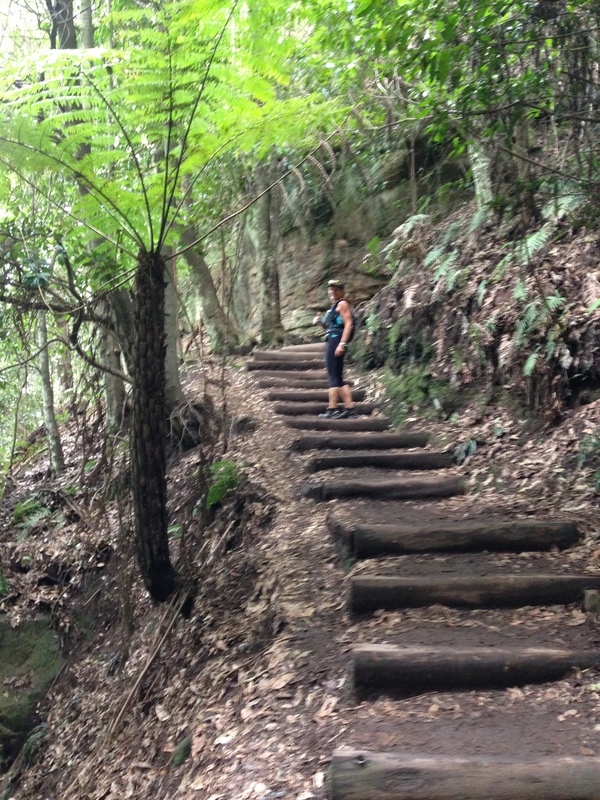 We ran along some more dirt sections and rocky sections and then we hit the rainforest. The changes in scenery around me were so impressive that day. It was breathtaking. 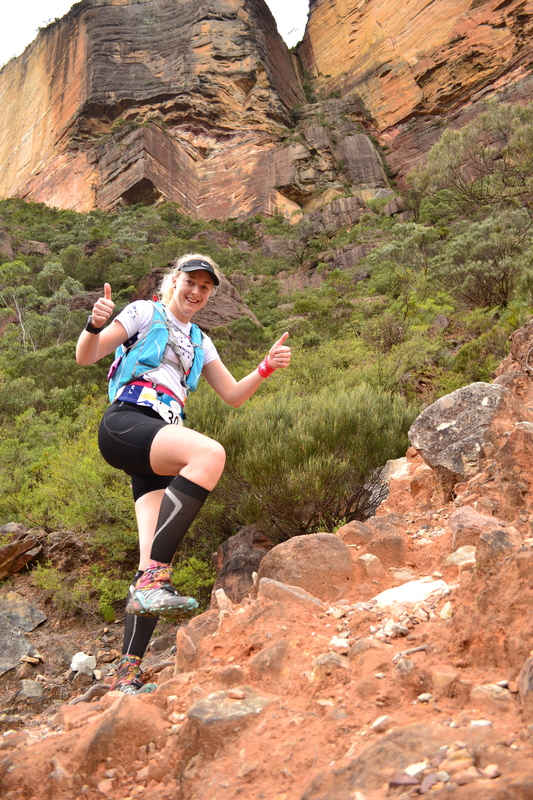 I took a break from photos through the middle sections which included the Furber Steps, as i concentrated on making it to the checkpoint within the cutoff time. I ran a few sctions with a lady called Tina, she was a lot faster than me on the flats so we played leap frog through a couple of sections here. She was a bit lost as we approached the Scenic Railway and thankfully i knew this section so I guided her towards the Furber Steps. 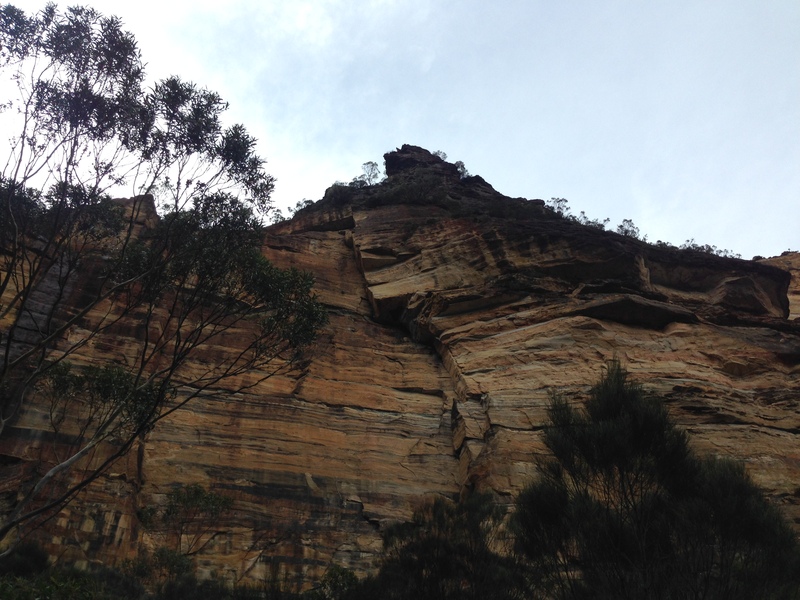 When I was about halfway up Furber Steps I looked back and saw Sarah-Jane, and if you’ve read the blog about my first marathon then you’ll probably remember this name. SJ kept me company during my first marathon and we ran most of the second half of the race together. 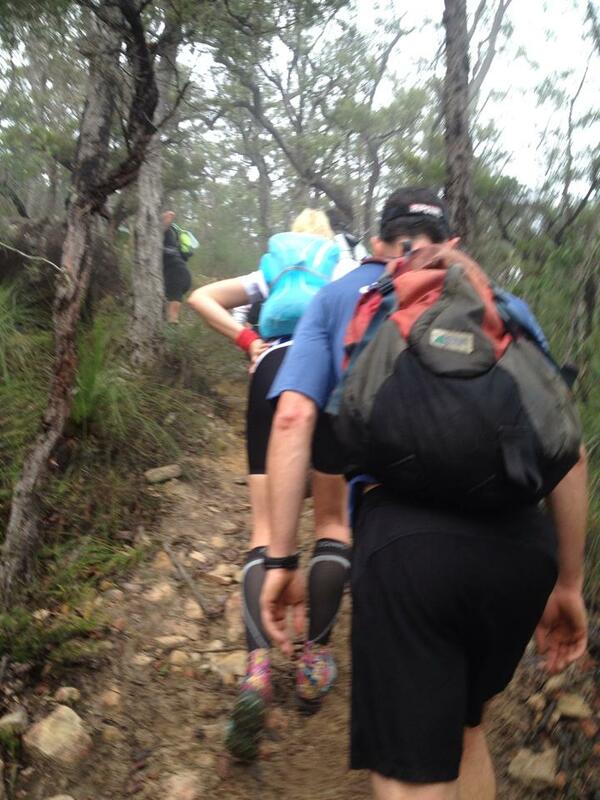 She’s an amazing ultra runner (who sparked the idea of doing an ultra long ago) and has a heart of gold. I was so happy to see her and we chatted all the way to the top of the stairs. She encouraged me all the way to the top and I was so glad to have bumped into her on the course. I made it to the checkpoint in 4 hrs 45 mins, so that gave me half an hours grace. I was so happy to have made it within the cut off time, as they had strictly told me that I would be pulled from the race if I did not meet the cut off. 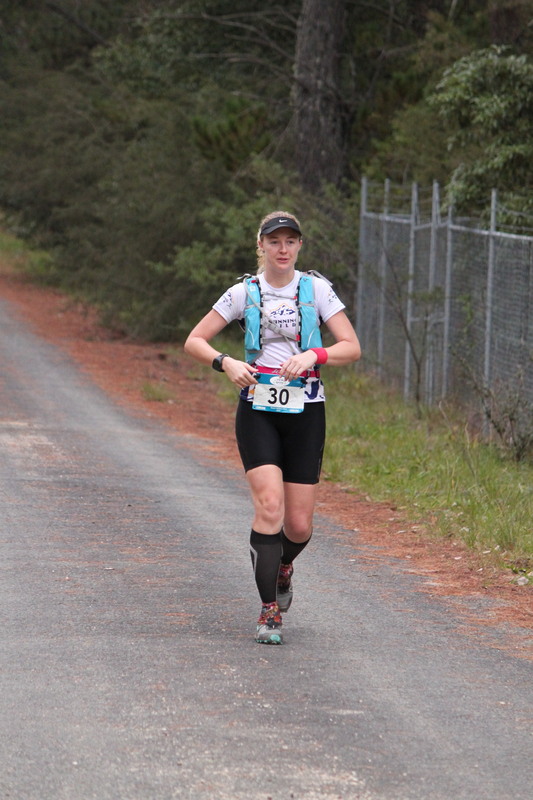 I wanted to get in and out as quick as possible too, as I still needed to make it to the finish line within 9 hours, and there was another 20km of tough course to come. We also ran into Sherin who unfortunately had to pull herself out of the race due to problems with her foot. But it was a mart idea for her as she didn’t want to jeopardise her TNF chances. So I wished her well and re-filled my water bladder and 2 electrolyte flasks, grabbed a banana and some lollies and headed with SJ and a few others back down the Furber stairs, I wanted to try and stay with them for as long as possible. They pulled ahead of me a little while after we had reached the flat section below and i settled in for some quiet alone running time with yours truly. It was a great time for me to clear my head and assess how I was feeling. I had not had enough water and so I started making an effort to try and drink more than I had been all morning. The time alone was very relaxing and it geared me up ready for the final hills that were to come. I knew there was another rocky section ahead of me and then the infamous Kedumba walls as the final climb. 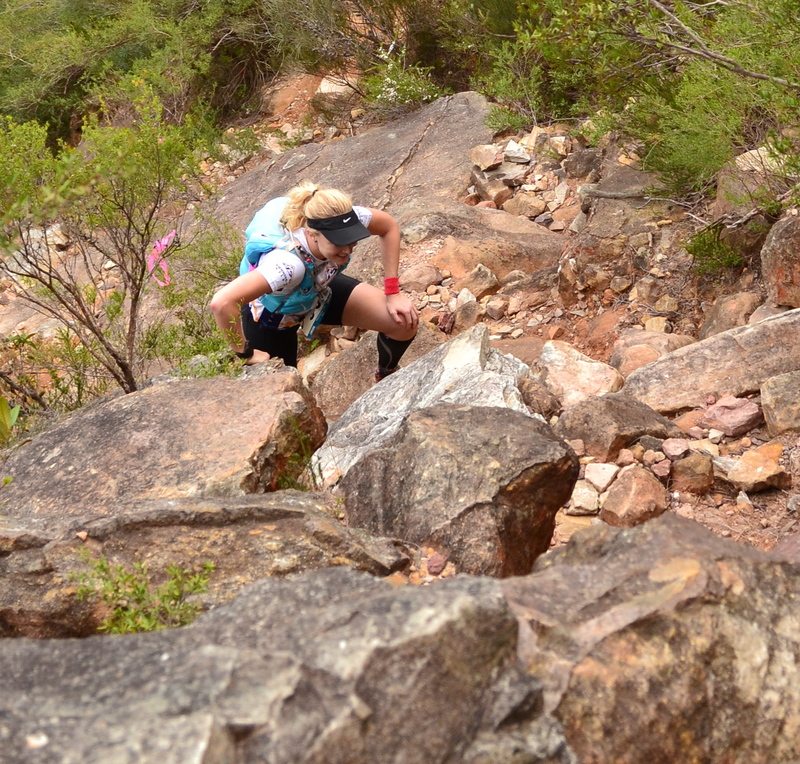 There were more and more rocks developing along the trail and it was getting steeper. I looked up to my left at one point and the cliffs were amazing (below). The next 2 photos are the official race photographers shots (GeoSnapShot.com) and they give you an idea of how steep some of the sections were. I’ve even got my hand on my knee to help me up at this point. The photographer just sort of appeared out of nowhere, so i’m glad I was smiling. 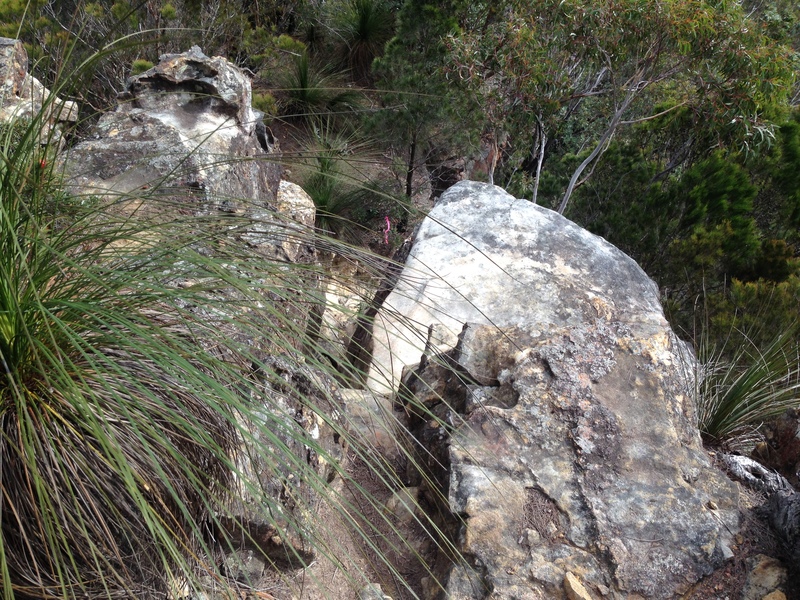 Then we left the rocks behind again and headed through another rainforest section. The colours and landscapes were all so different and it was almost surreal to be running in this place. Here’s Tina giving me a smile for the camera (below). Kedumba was tough, very tough. After all the grueling kilometers it was a slow journey to the end and i spent most of it by myself when I pushed Blake to go on ahead and not let me hold him back. I climbed and climbed and it felt like it was never going to end. But I managed to catch up to a guy called Darren who had run with SJ and i earlier. We chatted a little and eventually I let him go ahead too as he was speeding up and i didn’t have it in me. However he did encourage me to keep running and moving to get to the line quicker and with that I started running again as soon as I hit the peak of the hill. 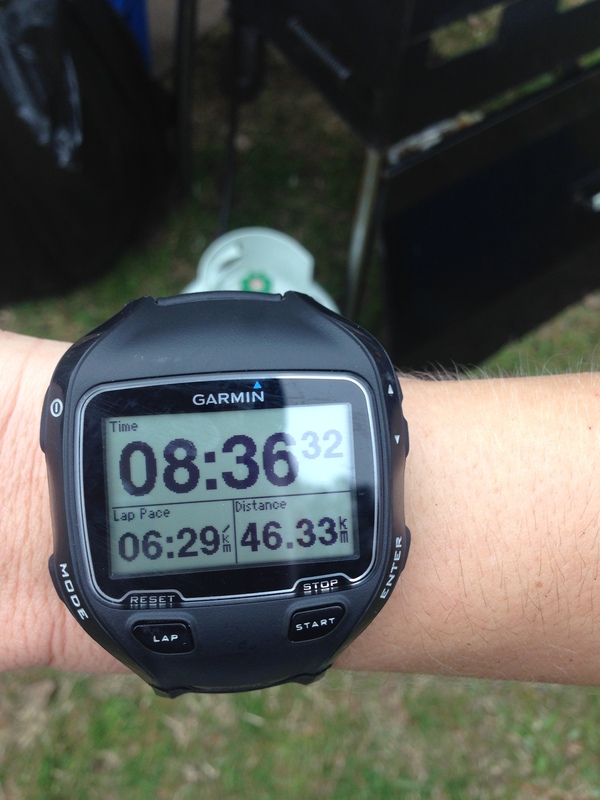 I ran the last couple of kilometers and crossed the line in 8 hours 36 minutes and 22 seconds, 3rd last over all. You could not wipe the smile off my face and as i crossed the finish line SJ was waiting for me with my medal and to give me a big hug!! 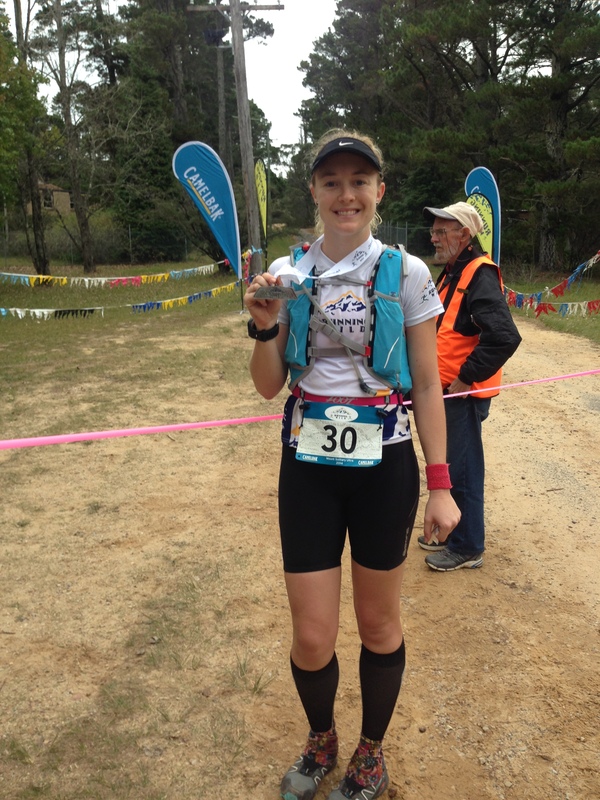 I’d had my doubts the week before the run and I was so happy to have completed another exciting chapter in my journey to TNF100. I came away from the race feeling a lot more confident about the big challenge that lies ahead in May, as i had handled this race and the course very well in my eyes. Especially when you consider that there were 11 people who unfortunately DNF (did not finish). 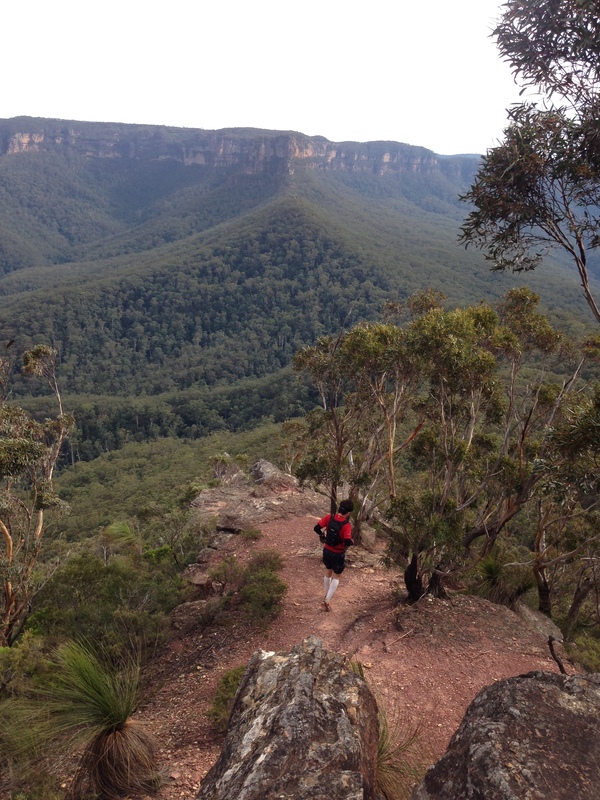 Now it’s time to taper and prepare for the biggest race of my life – bring on The NorthFace100 – 3 weeks to go!! 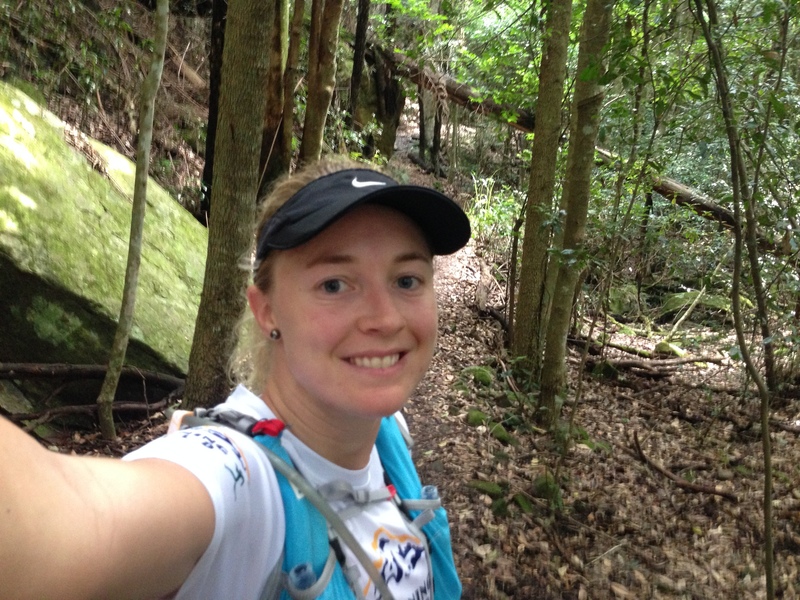 This entry was posted in Uncategorized and tagged #running, bluemountains, kedumba, marathon, mtsolitary, runningwild, TNF100, trailrunning, trails, ultramarathon, victory by laurenhailey. Bookmark the permalink.